I have thing for Berets. I seem to prefer them over beanies. Often because they are smarter to wear than a beanie and when I wear them most is for work. 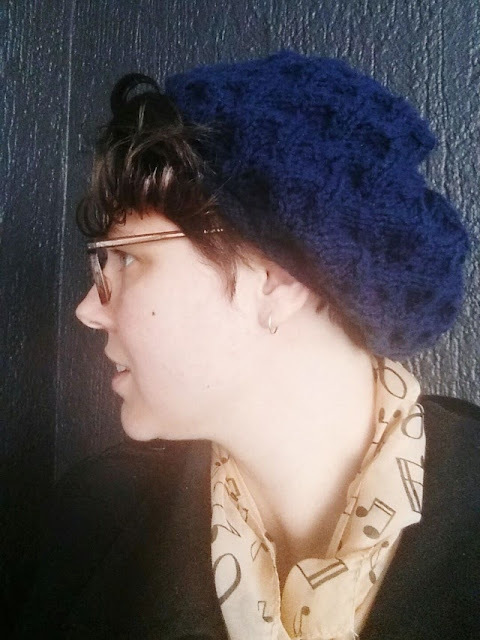 This beret was made to match my cowl I made for work. It is actually a matching pattern (by the same designer with the same lace pattern). I have also planned to make a pair of fingerless gloves to match as well. She hasn't got a set of gloves but I found these on ravelry that look similar enough to be able to work with. 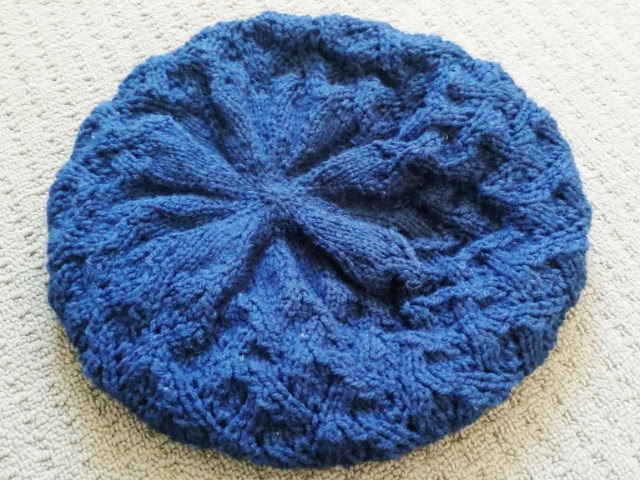 So here is the pattern I used for this beret. 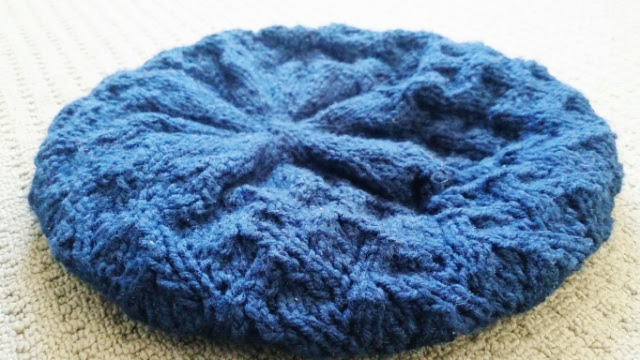 The beret de printemps. I tried to get all artistic and get a fancy photo. I think it turned out alright :D But you can really get an idea of the stitch. Also I know I've been lazy and haven't bothered to block it but honestly the moment it was finished it got placed on my head.... it's hard to block something on my head! I just think it looks so awesome on my head that I can't take it off for very long! I do like the interlocking lace in this stitch but it did take a long time to work up. And here you can see the side of my head. 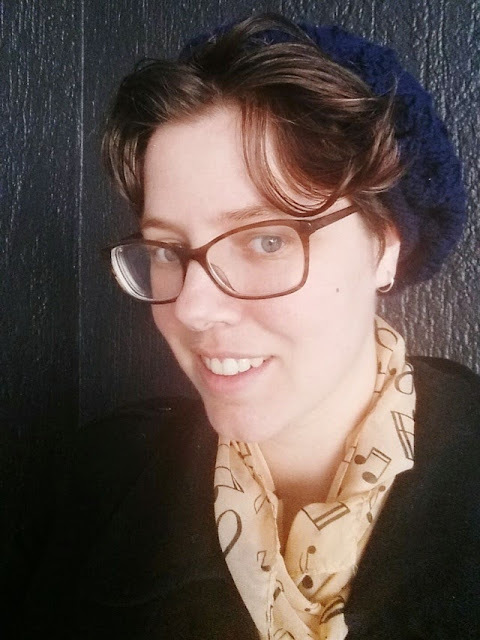 It has a slight slouch as should a beret without being slouchy and plays up my hair rather nicely.I also love that I can be lazy with hairstyles while wearing my berets. So much easier to style my hair!! So expect at least one more post eventually in my navy blue installments as I will be making some sort of glove and maybe even a different type of scarf. I have enough yarn to play around with and make a pile of different sets, whatever works and I can combine different types. I'm also torturing myself by teaching myself combined knitting ... which is continental with a couple of changes. I'm slower with it but I think that in time I will be MUCH quicker than I am with English style. Though I'm finding it confusing holding the yarn in the left hand. Oh well we shall see if I change styles or keep it the same in time. Look at you, all stylish and adorable! The beret looks great, love that blue.